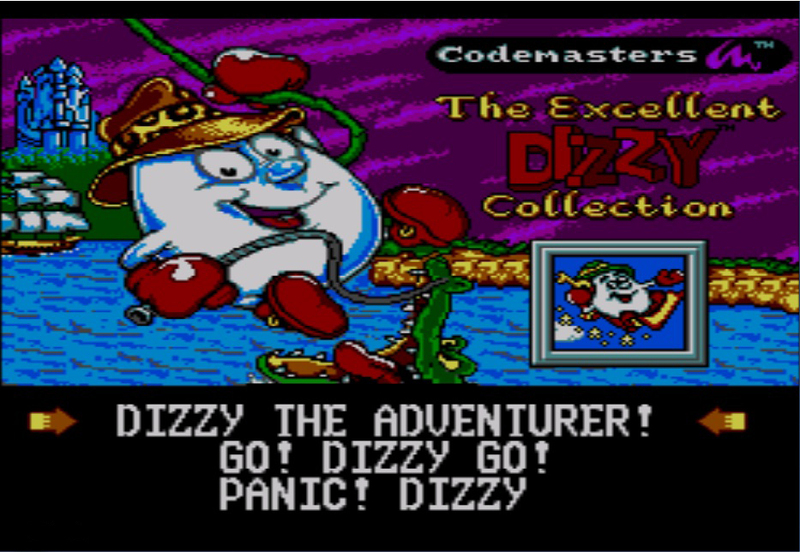 ​Dizzy The Adventurer; Panic Dizzy; Go! Dizzy Go! Released: 1993. Genre: 2D Platformer; Action; Puzzle. Taking its name from the 1990s spin-off puzzler release Dizzy Panic! and merely switching the words around, Panic Dizzy is a collection of straightforward puzzle games themed inside the Dizzy universe. However, reports would tell you that this is a re-hashed version of the title before, but it is not. In fact, it is an almost entirely different game. 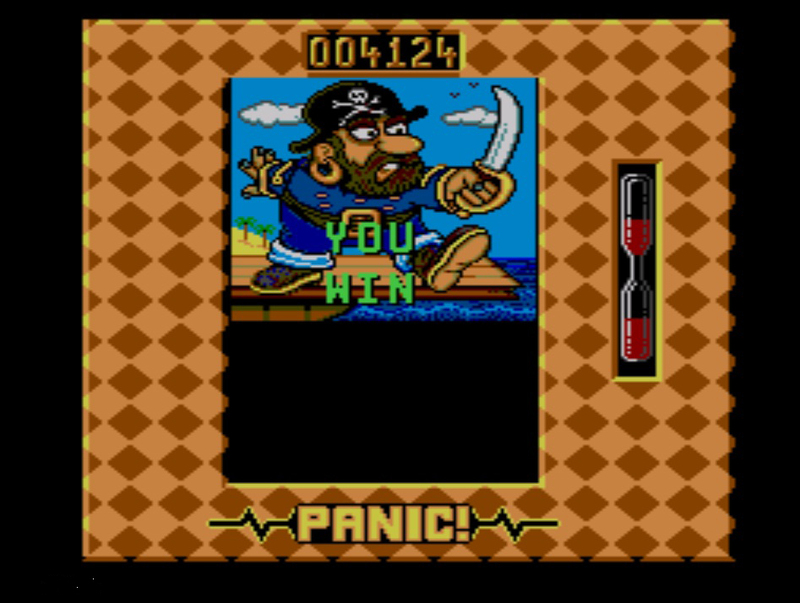 Dizzy Panic! Had you moving a conveyor of holes matching the shapes that fell down from the top so each shape could pass through. Here, you have the option of three separate puzzle jaunts based off exactly the same game engine. This reminds me of another Dizzy spin-off, Kwik Snax, whereas the C64 version was a completely different game to the other formats. 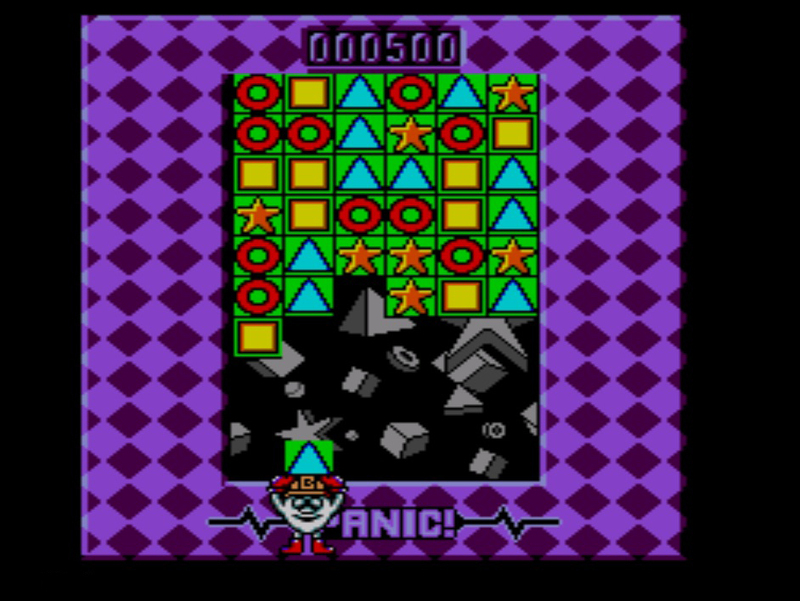 Panic Dizzy is more comparable to the Taito puzzlers Puzznic or Plotting, but without the visual finesse and thought-provoking strategy aspects. 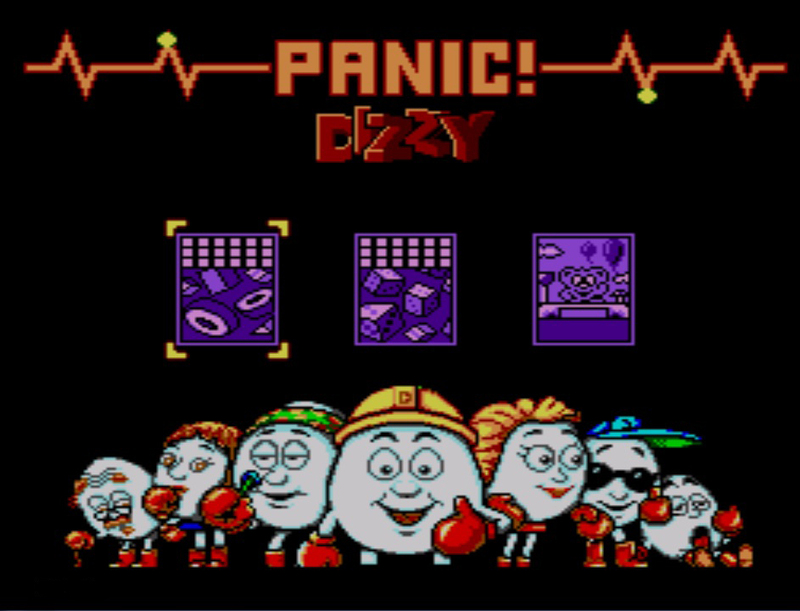 A lot of things about the game seem rushed and unfinished, and it’s a shame because if they’d managed a proper re-working of the original Dizzy Panic!, it would have been a far better game to pass away a few entertaining moments. I had a soft spot for the original version, the hole/shape-matching concept was quite good, but that has all been removed from this. You have the choice of three puzzle games; a shape-matching game, a number-matching one and a block picture puzzle. 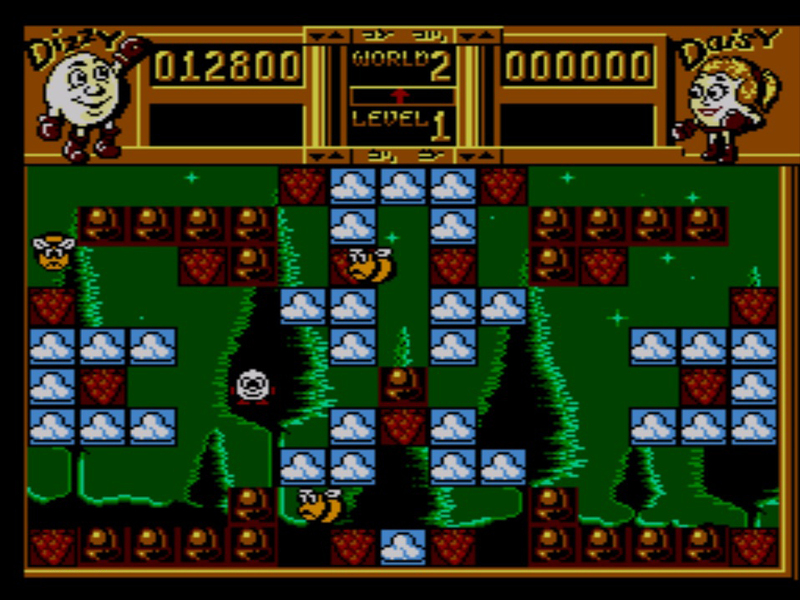 All of these games use the same methods; you have one on the yolkfolk removing and replacing blocks from below as the gameboard edges down towards you. The shape game is rather basic; match a horizontal line of corresponding symbols which will disappear from the board, the ultimate task is to clear the board completely before it reaches your character. This premise could sound fun for a short while, but unfortunately it’s just too dull. There are no surprise factors or bonuses and no variations. It’s all rather repetitive and mind-numbing. After the first few rounds it all just starts to get very tedious, with little to engage the player or give you any incentive to reach the next level. The number puzzle provides more of a hook, matching the dice blocks in lines to match the direction of the dots. This is more enjoyable as there is a wider dynamic, but it doesn’t hold interest for long enough. Passing a few stages on both games does bring a bit of contentment, but it gets insanely hard and far too dull soon after, prompting you to reach for the off switch. The picture puzzle game does save the game somewhat, but it is still very basic. The pictures get more scrambled with the higher difficulty and it’s your job to fit them together correctly, again by collecting blocks off the board and placing them elsewhere. Like a jigsaw puzzle can be fun to endure and complete, this is very much reminiscent of that. So, amusing for a short while with an ounce of achievable challenge, it makes the other games seem even hollower than they already are. With the visuals and sound, it’s all distinctly average with clear but uninspired basic graphics, with a quick nod to the impressive title screen. Better use of colours would have been advantageous and it has a soundtrack which can be summed up with the word “okay”. 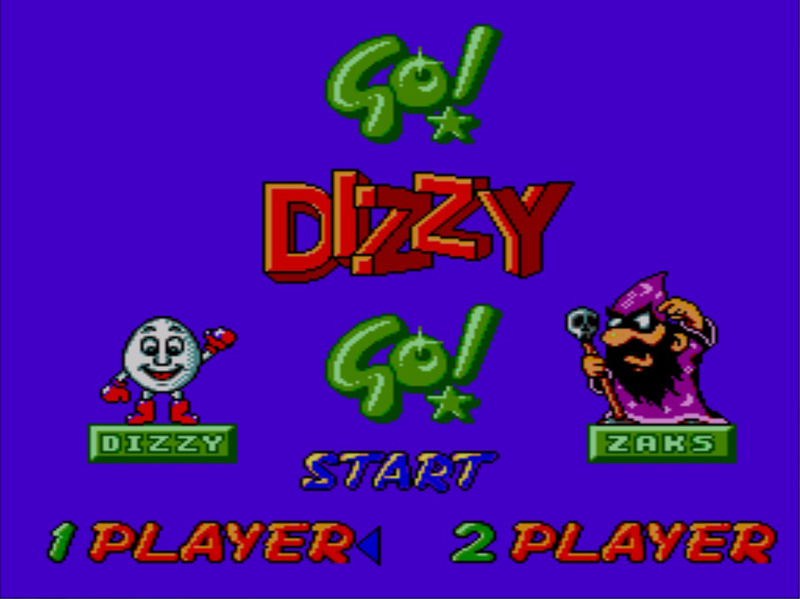 The tunes are in theme and produced satisfactorily, but are not in the least bit memorable compared to the expected quality from a Dizzy game. 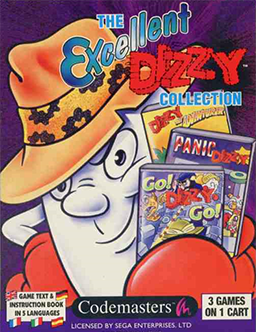 The weakest game on the compilation, Panic Dizzy is something of an endearing damp squib, giving us a mediocre and lacklustre puzzle selection of games which do provide a bit of fun for a very limited period, all the while being Dizzy themed to try and hold your attention for longer than is warranted. The visuals are passable, as is the audio, but altogether it feels a hurried title that doesn’t grab you for long or gives you any reason to persevere with. Certainly one for the die-hard fans and a shame it isn’t the game it’s name leads you to believe it is. I’m sure it will not come as a surprise given the very nature of this compilation, but regardless of the original title Go! Dizzy Go! 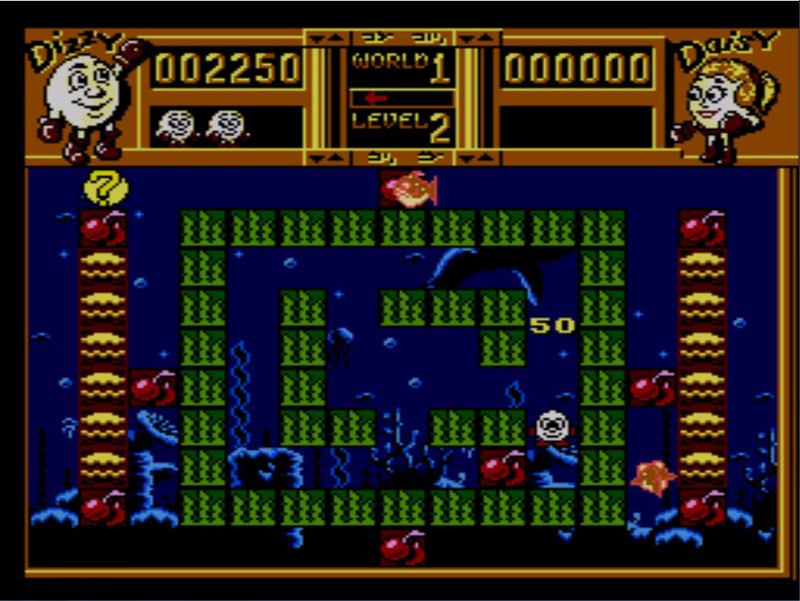 this not a new game either; it’s an extended and enhanced version of Kwik Snax released in 1990, although it is attributed as a separate Dizzy game. 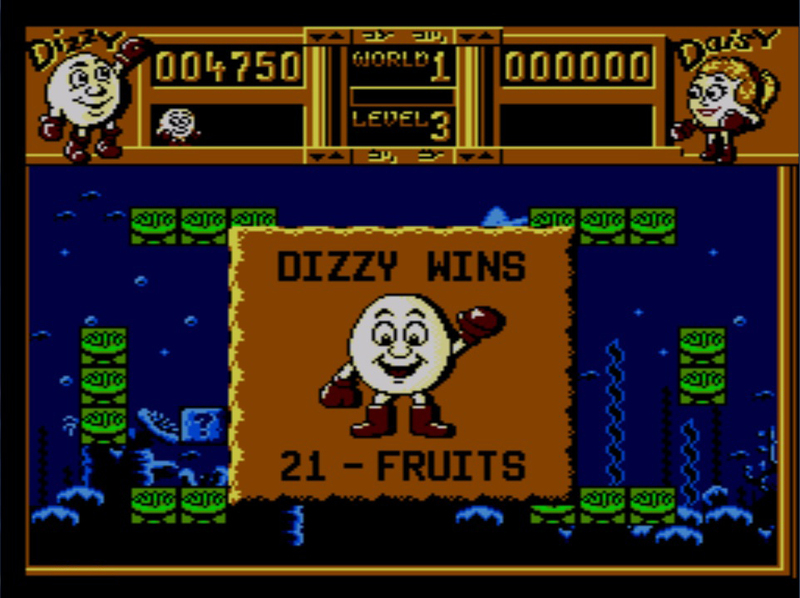 We have the same old story of Zaks’ endless torment of the yolkfolk, and this time Dizzy or Daisy have to make their way through a number of mazes set against different themes, collecting fruit and avoiding enemies to free all his friends. It’s not a complex premise in the slightest, borrowing from Pac-Man and Bomberman significantly. It’s a simple task of guiding Dizzy through each of the screens which get progressively harder. Power-ups are on hand to help, and unlike other static maze games there is an element of puzzler about it. Certain blocks can be pushed by our egg-man to gain new paths or destroy an enemy, and he can also walk off screen and reappear on the opposite side, something which many of the enemies are unable to do. While the sheer simplicity of this little arcade romp may deter a few, it’s actually all rather basic fun and fairly addictive. The visuals aren’t groundbreaking, but they are neat and tidy, clear and defined with that little bit of Dizzy fortitude evident. The colours are well chosen with a nice balance of dark and light, and make it all look rather appealing if straightforward. The backgrounds are slightly inconspicuous, but once noticed look marvellous. The animation could be a little smoother as seen in other SMS titles and the responses could be sharper, they are a bit dim-witted but are sufficient enough to make satisfying progress. The music is of course in stereotypical Dizzy territory, with well-conceived blippy and playful tunes playing throughout. Some are a little annoying, but combined with the right balance of good and appropriate SFX it’s not bad at all. Straying away from the Dizzy blueprint however is the difficulty; it’s not a big challenge to finish by any means. A couple of hours play and any experienced gamer will be rescuing all the yolkfolk in little time. The enemy sprite behaviour is a tad predictable, and so can be judged with relative ease. A perfect game to whittle away a passing twenty minutes or so, though its more likely you will be glued to it for a lot longer. This would be a great candidate for a smartphone app, it’s addictive and amusing and would work well as a portable, however there is not a whole lot of game and therefore the interest of it does wane so soon.